This uplifting collection of Zig Ziglar's personal letters paints a vivid portrait of a family in which love abounds-and serves as the foundation of every relationship. These letters reflect the innermost thoughts and feelings of a loving husband and devoted father who is totally committed to the physical, emotional, and spiritual well-being of his family. "Quality time" versus "quantity time"
These letters reflect the innermost thoughts and feelings of a loving husband and devoted father who is totally committed to the physical, emotional, and spiritual well-being of his family. For readers everywhere, these intimate communications about life and love and family can provide a practical guide for building and strengthening their own family relationships. I have always been impressed with what Zig Ziglar had to say and how he shared it too. Not only through his books and public speaking, but in how he lived his life and how he loved his family. This book gives you an inside look into Zig Ziglar's heart and in how what we saw in his external life also continued in his writings to his own family too. 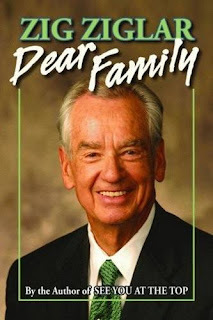 This book allows you to see Zig Ziglar as a human and you leave with valuable insights into how each of us should aspire to live our own lives too.